The Most Important Money Management Rule that Most Traders Forget – Why? What is the one rule that all professional traders use, but many retail traders forget, or are simply unaware of? We all know that the goal of trading is to make money, and as long as you have an edge in the market, you will be profitable in the long-run. So the next question is, how do you maximize your profitability without blowing up your account? The answer lies in the 2% money management rule. Let’s use a hypothetical example where you start betting with $10,000. In this scenario, you have hitrate (winning chance) of 60%, and you either win double of what you bet, or lose the whole sum of what you bet. How much would you bet each time? If you bet the whole $10,000, you have a 60% chance of doubling your money, but you also have a 40% chance of losing everything. That is exciting for a gambler, but not ideal if you want to remain profitable in the long-run. What if you split your $10,000 into 2 bets of $5000 each? Your probability of losing 2 bets in a row is only 16% (40%*40%), which means your chances of losing everything is much less. Sounds good? What if you take it one step further, and split your $10,000 into 10 bets of $1000 each? The odds of losing everything drops to just 0.01%. In trading, the secret of money management is not to focus on making the most money, but rather to ensure that you do not lose your capital. As Warren Buffet once said, the number one rule of his is to not lose money. How does this apply to your trading? With this 2% money management rule, the only way to lose all your trading capital is to lose 50 times in a row, and the probability of that happening is less than 0.000000000000000001%. We have most likely heard horror stories of traders blowing up their account, and that is happens when they break this rule. If you stick to this 2% money management rule, it is almost impossible for you to blow up your account, and you will see a marked improvement in your trading results. And this is what separates the professionals from the average trader. https://i1.wp.com/synapsetrading.com/wp-content/uploads/2015/05/MG_9839.png?fit=1980%2C1380 1380 1980 Spencer Li http://synapsetrading.com/wp-content/uploads/2014/03/logo-header1.png Spencer Li2015-05-29 04:36:372019-03-07 02:29:38The Most Important Money Management Rule that Most Traders Forget - Why? Many new to trading have the tendency to liquidate positions that show a small profit, yet they keep those positions that show a loss as are unwilling to take a loss, in hope that prices will rebound. Such a counter-intuitive strategy will result in small wins and large losses, but why do people still do it? The new science of behavioral finance psychology may offer an explanation. Investors are less willing to recognize losses (which they would be forced to do if they sold assets which had fallen in value), but are more willing to recognize gains. This can be explained by the value function curve, where investors turn more risk-seeking as the stock depreciates. As shown by studies on ex-post returns, it would be more profitable to cut losses fast and let profits run. Hence, investors should treat unrealized losses as a sunk cost, and focus on reducing prospective costs (likelihood of more losses). Unfortunately, irrational hope destroys any edge their analysis provides, thus resulting in an unfair gamble. 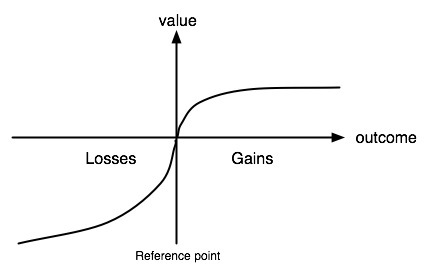 With its roots from prospect theory, this refers to investors’ tendency to strongly prefer avoiding losses to acquiring gains. 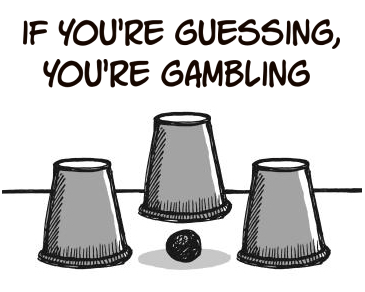 For loss aversion, investors prefer an uncertain gamble to a certain loss as long as the gamble has the possibility of no loss, even though the expected value of the uncertain loss is lower than the certain loss. For the breakeven effect, investors prefer a gamble that offers the potential of recovering to finish at an aspiration level rather than a certain rate of return. If prices fall past their stoploss (showing that their analysis was wrong), it means that the odds are now against them. If prices fall but do not hit their stop, and subsequently rises back to breakeven, it actually shows that their initial analysis is still correct (not proven wrong), which means that exiting at breakeven is in fact destroying their winning trades. This will lower their hitrate by causing them to exit winners prematurely. How can traders overcome these biases? Traders should keep mind that trading with an edge will increase their wealth over time, but it is not possible to be right on every trade. The number of times you win or lose doesn’t matter. It is how much you lose when you are wrong and how much you win when you are right that matters. One should also separate decision-making from execution, meaning to “plan the trade” and “trade the plan.” A good way to manage risk is to use a stoploss to limit one’s downside, and pick trades with good R/R (reward:risk ratios) so that one’s winners will be more than their losers. This will allow one to cut their losses fast, and let their winners run.